"Katsu" is Japanese for powerful. The Katsu products are highly concentrated and have a wonderfully strong effect, yet are so well-balanced that they remain subtle and useful for regular consumption. Kenshin Trading Company, the importer of Katsu products from Japan, has brought in two of the most favored modern health products: garlic and kelp. Garlic is well-known for having several medicinal properties. Its odor, which can persist long after ingesting it, has often been a deterent to use of this famous herb as a preventive health care product, but odorless forms of garlic extract in pill form have been developed. These are somewhat less potent than the highly odored and sometimes irritating raw garlic as anti-infection agents, but are fully active in helping to reduce blood lipids, maintain artery flexibility (see story next page), and promote blood circulation. 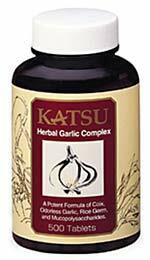 Katsu Garlic is prepared in small round tablets that are taken five at a time for a standard dose, three times daily. A bottle of 500 tablets will last for more than a month. This unique formulation includes concentrated extracts of coix (sometimes called pearl barley, it is also known as Job's Tears) and shark cartilage, plus natural vitamin-B complex from rice germ. These substances assure that Katsu Garlic is more potent, better tolerated, and has a wider range of benefits than any other garlic preparation. Shark cartilage is a famous soup ingredient in the Orient, greatly sought after because of its benefits to the circulatory system in preventing diseases of aging. Coix is utilized in traditional Oriental medicine to remove excess fluids that congest the joints, and to improve the clarity of the complexion. The B-vitamins reduce atherosclerosis and improve circulation. Katsu Kelp is also prepared in small round tablets (330 mg each), to be taken five at a time for the standard dose, one time daily. A bottle of 400 tablets will last more than two months. This kelp is not the ordinary kelp leaves, full of salt: this is kelp root-a mixture of powder and extract-that has had the sodium reduced from 13% to just 3%. The seaweed is pure, harvested off the shores of the northern island of Japan, Hokkaido, where the water is cold and clean. Seaweeds are known for their iodine content: a five tablet serving of Katsu Kelp will provide about 10 times the iodine needed to avoid developing low iodine thyroid disorders. An area of current interest is the soluble polysaccharides of kelp, such as fucoidan, laminarin, and alginate that may have antiviral and anticancer activity. Research further indicates that kelp may help lower blood pressure, relieve constipation, reduce fluid swelling, alleviate joint inflammation, and regulate metabolism. The combination of Katsu Garlic and Katsu Kelp is a remarkable therapy for the circulatory system. COLUMBUS, Ohio: A healthy dose of garlic in the diet may help prevent hardening of the aorta, the major artery that carries blood from the heart, according to a new study. The aorta hardens naturally with age, but a more elastic aorta is beneficial because it conducts blood smoothly from the heart and puts less stress on other organs. The study also revealed that eating garlic benefits people's cardiovascular health more as they get older. Harisios Boudoulas, professor of internal medicine and pharmacy at Ohio State University, collaborated with researchers from the Centre for Cardiovascular Pharmacology in Mainz, Germany, including the Centre's director, professor Gustzv Belz. They measured the stiffness of the aorta in more than 200 German men and women, half of whom took 300 mg or more of standardized garlic powder in tablet form every day for two years. The subjects who took garlic supplements demonstrated a 15 percent lower average aortic stiffness than subjects who did not. "The aortas of our 70-year-old subjects who took garlic were as elastic as the aortas of 55-year-old subjects who didn't take garlic," said Boudoulas. He and the German researchers published their results in a recent issue of the journal Circulation. The aorta is the large, branching artery that delivers oxygen-rich blood from the heart to the rest of the body. Boudoulas explained that a healthy, elastic aorta billows outward with each pulse. As it relaxes, blood flows smoothly to outlying arteries and organs. Doctors have known this for some time, but until recently, none had investigated the effect of aortic elasticity on health. "Prior to a few years ago, the aorta was considered nothing more than a pipe that transferred blood from the heart to other organs, but now we know that it's a dynamic organ in itself. The aorta helps keep other organs healthy, because it regulates the velocity of the blood that travels through the blood vessels with each pulse," said Boudoulas. Boudoulas said that when the aorta loses its elasticity, it can't expand to accommodate blood, and each pulse from the heart squeezes straight through the narrowed passage at high speed, which puts stress on the body. "Every time the heart contracts, it gives stress to the aorta," said Boudoulas. "We've done some studies here at Ohio State to suggest that as we get older, the first organ to suffer is the aorta." The aorta stiffens naturally with age. For men, the process begins in their early 50s, and for women, after menopause. The subjects in this study were healthy, nonsmoking men and women ranging in age from 50 to 80 years. Both groups-with garlic and without-were made up of a roughly equal number of men and women. Boudoulas and his colleagues measured the velocity of the blood pressure wave through the aorta, called the pulse wave velocity (PWV), for each patient in the study, by recording the amount of time pulses of blood from the heart took to reach the femoral artery in the leg. Researchers measured the PWV for subjects at rest and during mild exercise. On the average, the stiffness of the aortas of subjects in the garlic group measured 15 percent less. "The effect was larger than we had expected, and the effect was most pronounced in the older age groups," said Boudoulas. The positive effect of garlic was more than 3.5 times higher in the 60-69 age group than it was in the 50-59 age group. In the 70-80 age group, the effect was more than 4 times higher. Boudoulas said this may reflect that the fact that in younger people the aorta is more or less functioning normally regardless of garlic intake. The subjects of this study consumed garlic tablets, but Boudoulas said that the benefits of garlic are the same whether it's taken in pill form or in food. He added that the only side effect of eating garlic is the odor, which people can eliminate by taking pills. "It's difficult to say at this time whether everybody should increase their garlic intake," said Boudoulas. "But the data we have so far very strongly suggests that it prevents stiffening of the aorta." Boudoulas said that maintaining a healthy aorta may prevent age-related damage to other organs. "When the pulse wave velocity is not too fast, it prevents damage to other organs like the brain and kidneys," said Boudoulas. "So maintaining a healthy aorta may prevent damage to other organs that normally suffer with age." Boudoulas said that in the future he wants to find out more about how garlic improves aortic elasticity. "Right now it seems that garlic improves the function of the endothelium, the tissue that covers the inside of the arteries. The garlic may cause the endothelium to secrete some substance to dilate the vessels and make the aorta more elastic," he said.